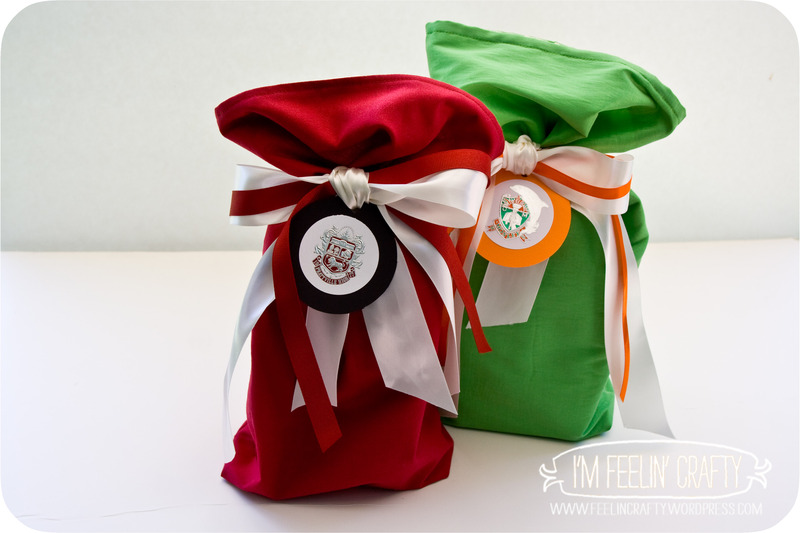 Like for instance these graduation gifts. Yes, these girls graduated in May and it’s what… August? September???? oops! It took me a little while to figure out what to get them. Then I ordered the gifts and it took a little while to get here. Nope, I didn’t order it from Zappos. I LOVE Zappos and thier free next day shipping!Yes, I did just get a package from them today! Totally beside the point, but…. So then the gifts were here and I had the boxes to mail the gifts in sitting around the house and driving my husband insane! The not so bad part of my problem. I do get the gifts and I do give them. Sometimes it’s just a little late. So if you’re a someone who should be getting a gift from me… It will come, just maybe not on time. My apologies up front! Hmmmm…. That almost sounds like a good name for a new business venture… hmmmm…. I’m so excited about this project! 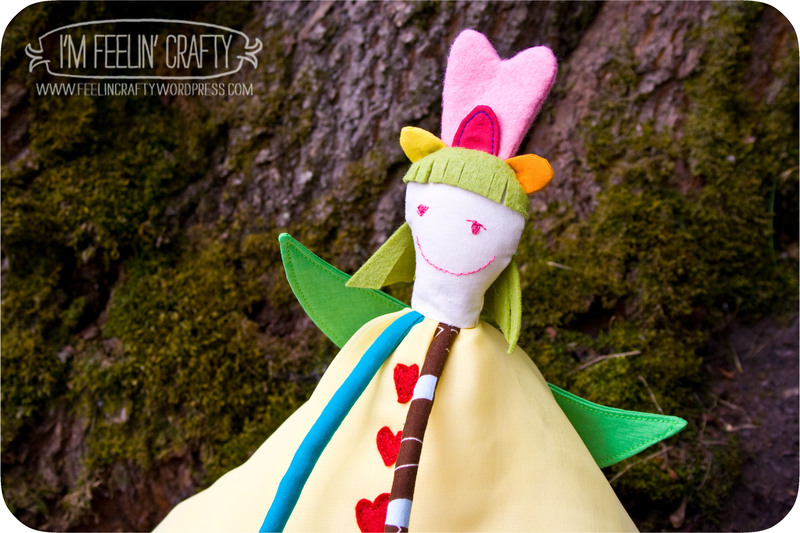 I love the little flower fairy doll I just finished up for a little girl from my son’s preschool. Honestly, it was kinda hard to give away!! Our preschool auction came up not longer after I (I mean Santa and the Easter Bunny) made my son’s Bear and His Best Friend Pear duo. Remember, this was a project I did based on an idea he had. I had a great time putting his ideas together in stuffie dolls. The project turned out so cool that I donated a stuffie project as an auction item for the Preschool auction. It sold and this was the image I got to go on. 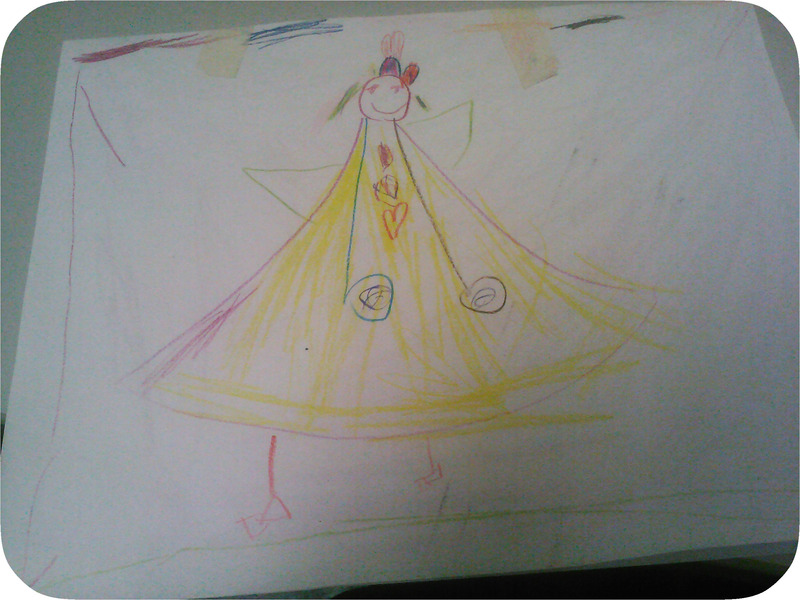 Drawn/designed by a Pre-K’er. And this is what came from the drawing. Made by a Momma! It was pretty fun! I’m usually pretty good at sewing and getting everything right the first time. But I had a few struggles with getting some pieces just right. I made the feet a couple of times before I got them right. and one of them is still a little off, but I feel like it’s pretty close. So what do you think? 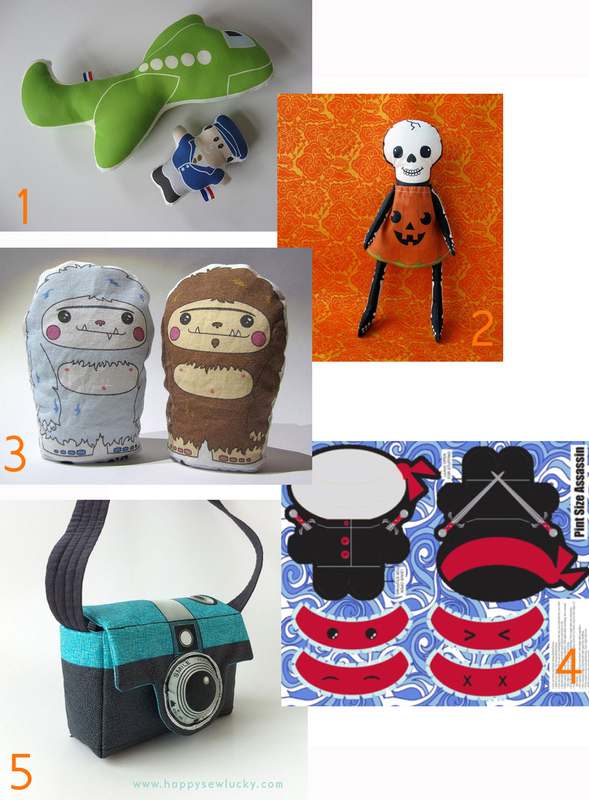 Add Design Your Stuffies to my Etsy shop??? hmmmm…. 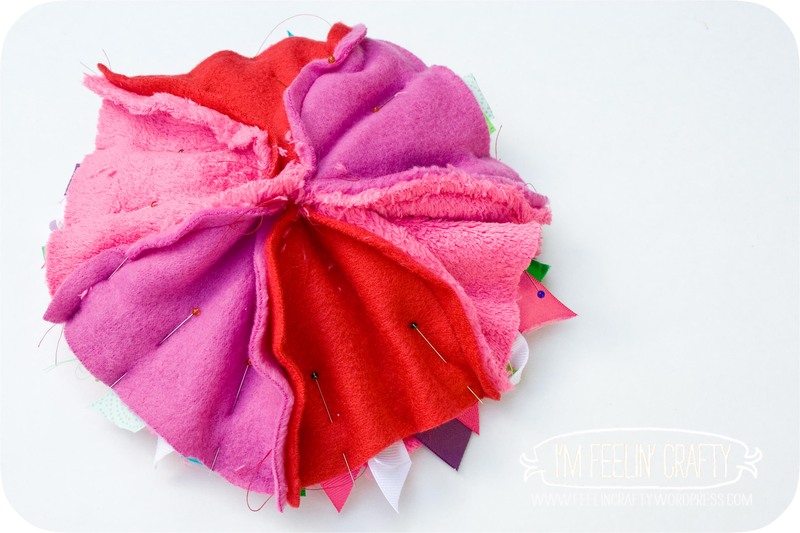 It’s a Jellyfish, No it’s a Tag Doll, No it’s a Tutorial. Or is it All Three??? If you guessed D, You’re right! Congratulations! Yea, for you! Give yourself a pat on the back!!! Did the title give it away??? OK, I’ve been talking a lot about my friend that was here and motivated me to get those dragon wings posted on etsy. Well, she has a two-year old daughter who is addicted to tags! I made her a ghostie and I’m sure she loves it, but it doesn’t get played with very often because of the lack of tags…. While she was here, she didn’t want to wear her shoes because she found a tag on them. And one day we were at the zoo and noticed she was all tangled about in her shirt. She had found a tag on the bottom side of the shirt! In order to fix this we decided she needed a little tag stuffie. Of course my friend just wanted a something simple, but I had to make it into something a little more…. A jellyfish! Step 1: Gather materials. 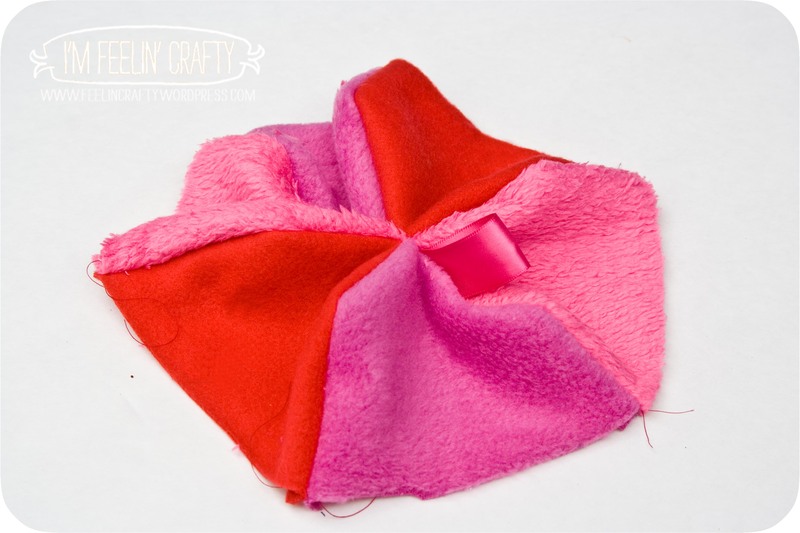 Fleece, or any soft fabric for the jellyfish body. 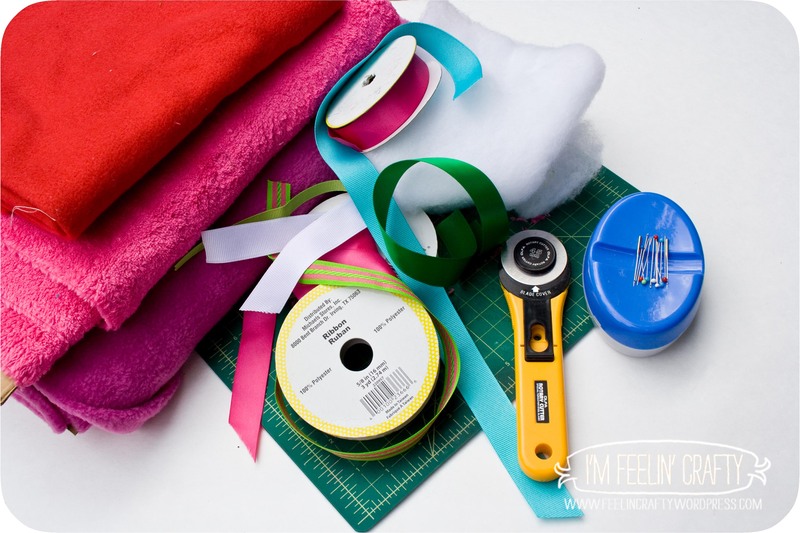 Ribbon, of course, pins, pattern, stuffing and a cutting tool. Step 2: Cut out the top pieces. You need 6. I used 3 colors, so I cut 2 of each color. Step 3: Sew three of the top pieces together. Repeat. Step 4: Then sew the 2 pieces of the top together. I also added a little ribbon tag here in case you want to hang the jellyfish. And don’t forget to leave a little hole in the side somewhere to pull the everything through. Step 5: Cut the bottom circle. 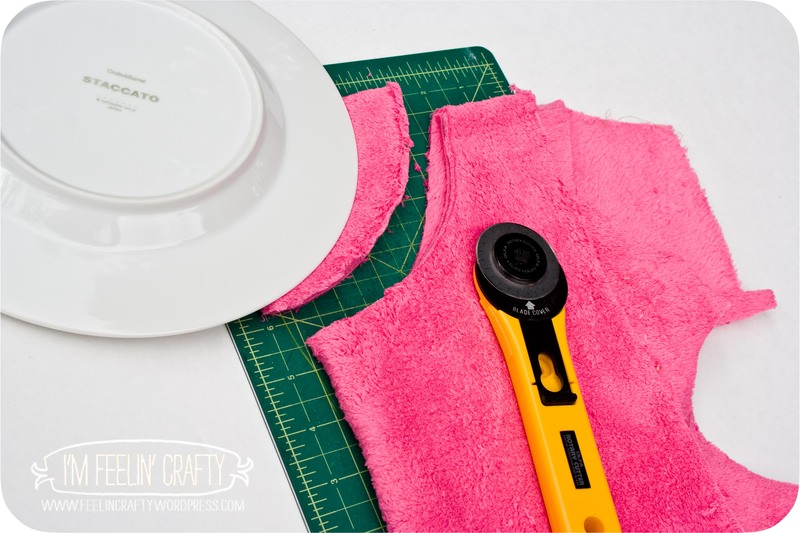 Fold the bottom fabric in half and then in half again. I used a plate as a guide for the circle. 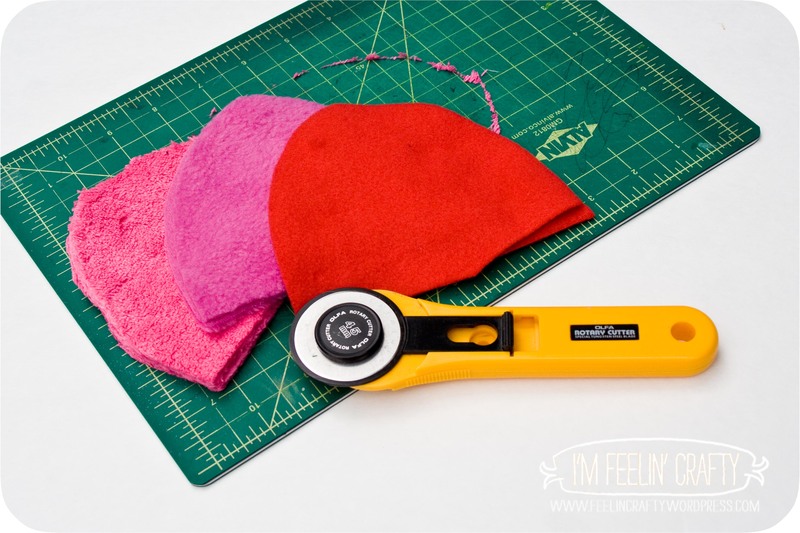 If you use my pattern pieces for the side, you’ll need a circle with a radius of 4.5″. 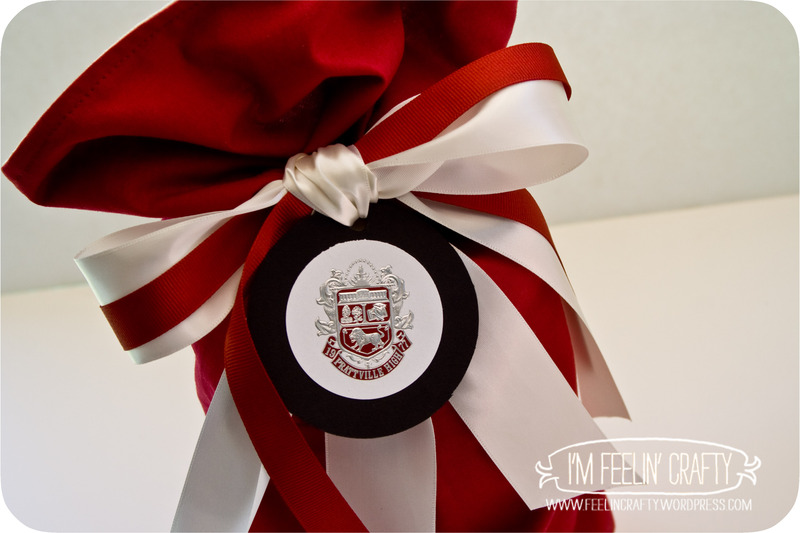 Step 6: Pin on the ribbon tags to the bottom circle. As many or as little as you’d like. I cut my ribbon between 2 and 4 inches and folded in half for the tags. I spaced mine about an inch or so apart. 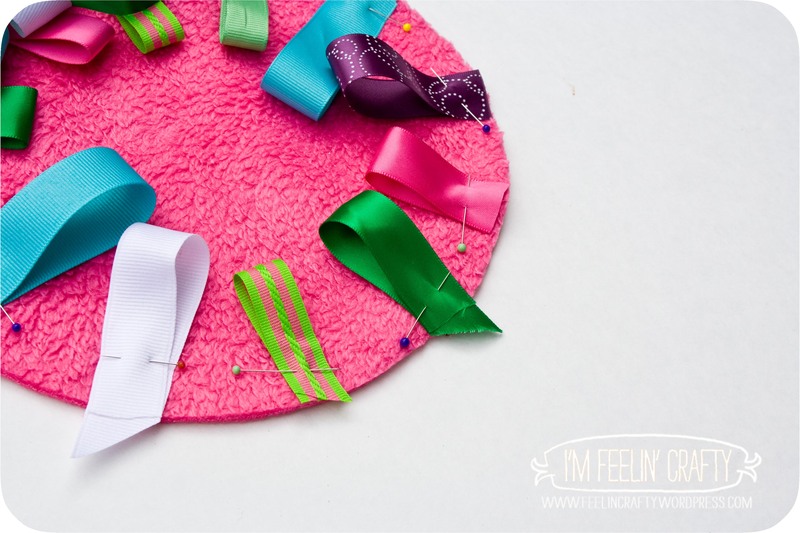 Step 7: Pin on the ribbons to the bottom of the circle. 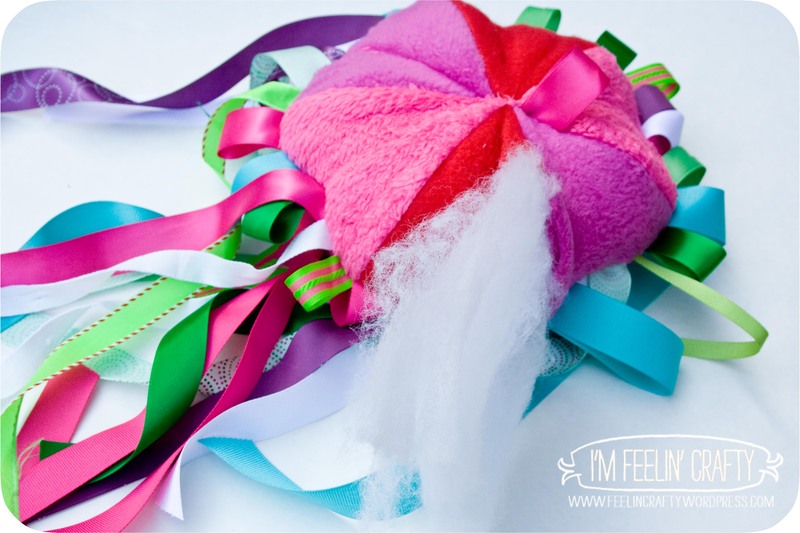 If you have decorated ribbon, pin so the wrong sides of the ribbon and bottom circle are together. I put 2 ribbons between each tag. 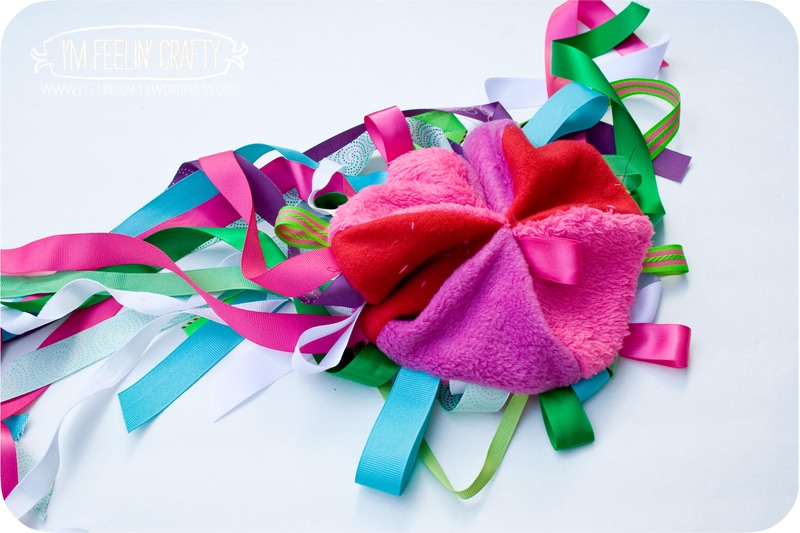 Step 8: Pin the top to the bottom and stuff all the ribbons inside the body. Step 9: Sew around the edge of the circle. Go slowly! 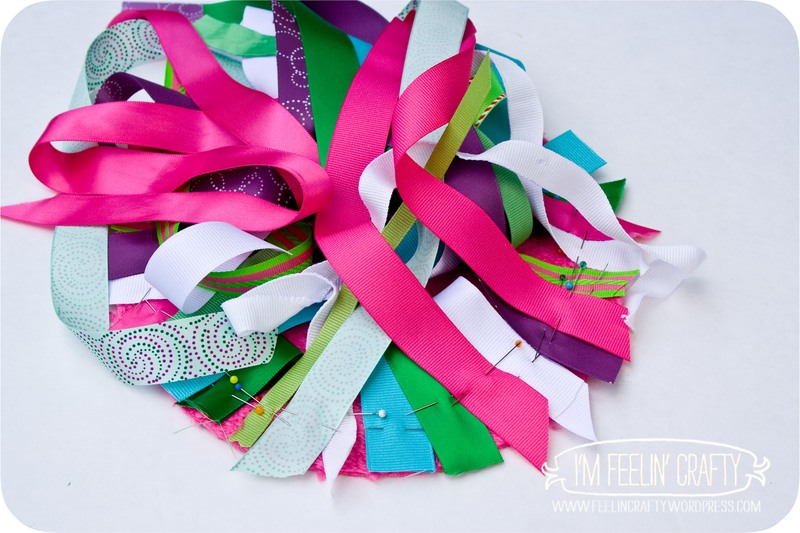 You end up with a ton of pins, and you’ll more than likely be sewing over a few here and there. So I went very slowly. 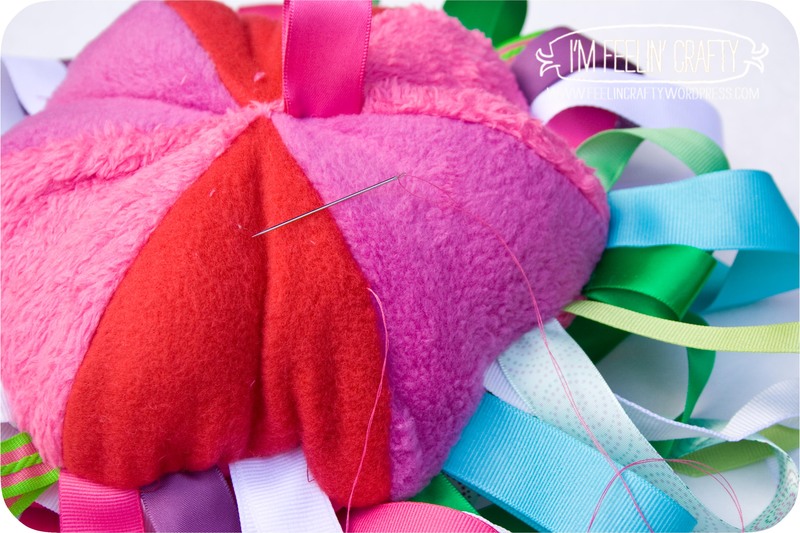 Step 10: Pull all the ribbons and the jellyfish through the hole so that it’s right side out. Careful! Remember how I mentioned that you end up using a million pins?? Well, about half of them are going to want to poke you as you pull the jellyfish right side out! Step 11: Stuff the jellyfish. 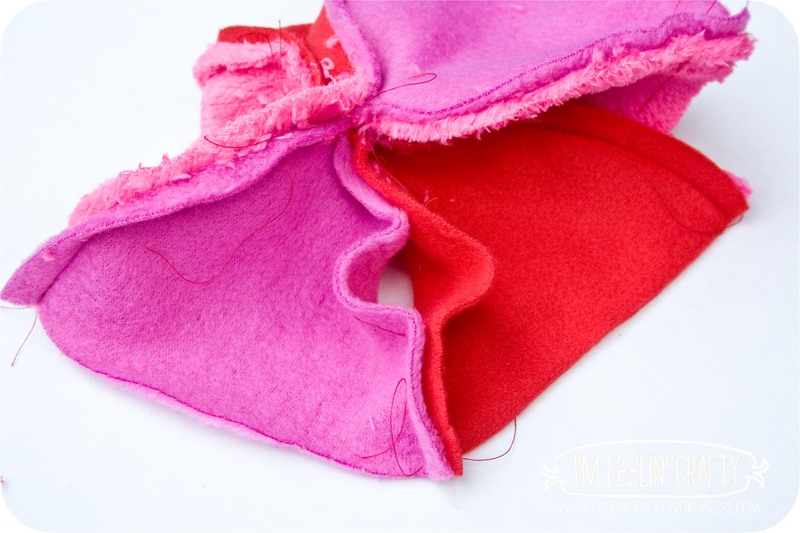 Step 12: Sew up the hole in the side. I do it by hand. Wahla!!! 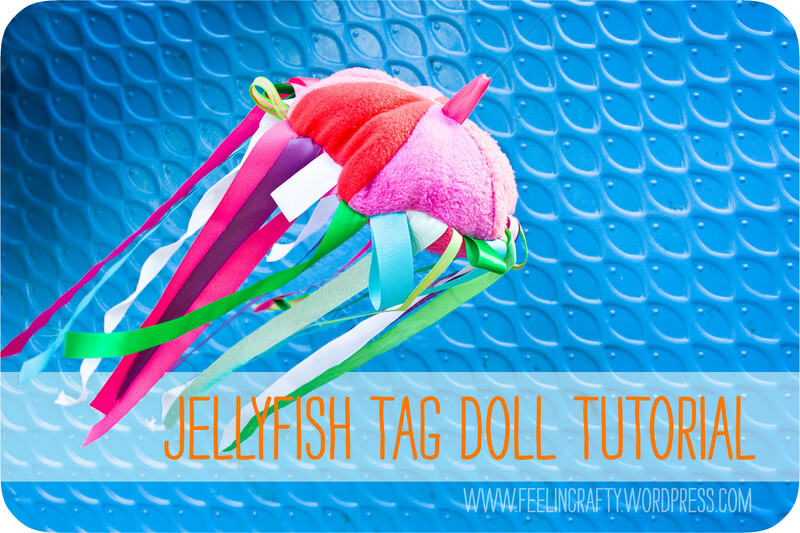 You have a jellyfish tag doll for those kids in your life that love tags! 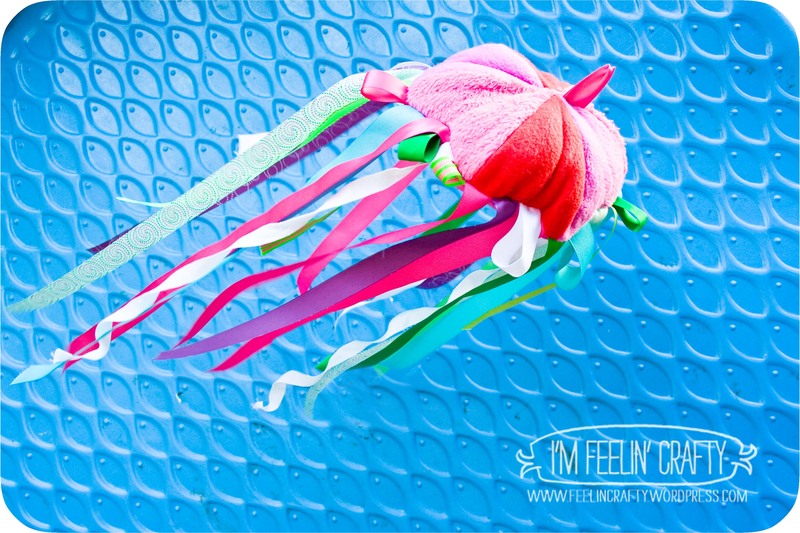 As I write this, I realizes that this could also be a beautiful Under the Sea party decoration as well!! hmmmm….. I’m always thinking…..
ok, remember last weekend when I mentioned I had a friend in from out-of-town that was trying to get me focused to get a few things off my to do list? Well, I marked one off the to do list! 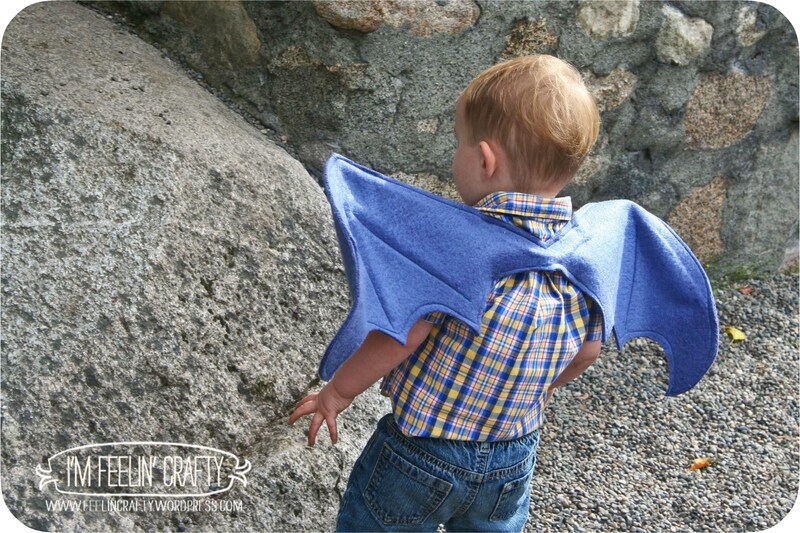 I finally got my Dragon Wings up for sale on Etsy!! Yea!! If you’re one of those people who don’t want to or have the time to make your own… I’m here for ya! Maybe I’ll get some more Dragon Party themed party pieces up soon, too! Two things happened recently to remind me of a project I started a few years back and never finished… I had started an ABC of fake animals photographs I had taken… The idea was that it was going to be a book. But of course I had other ideas of what to do with the photos. 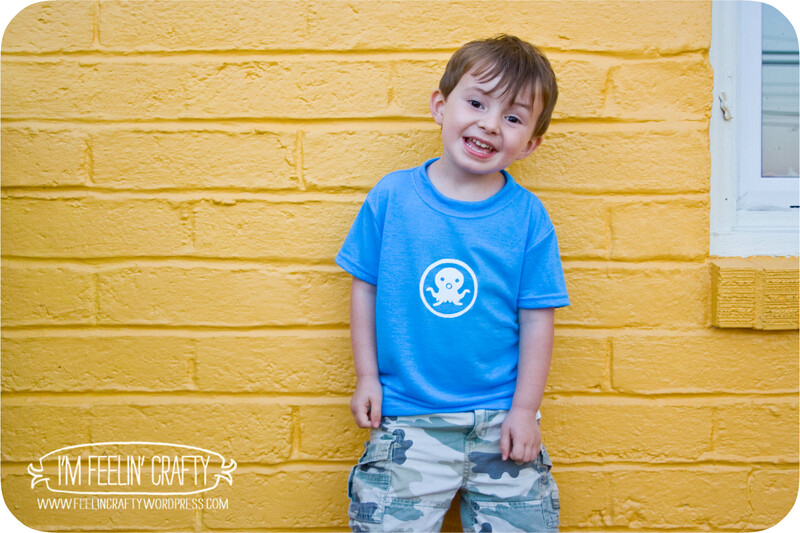 Like maybe have them printed on fabric and make ABC blocks… Yep! I was gonna do it. And am now excited about finishing it! oh, yeah, those two things that reminded me about it.. One, I am so excited to have a close high school friend visiting me this week with her family and she is pushing me to get some of my projects done that I’ve been talking about… And two, I saw this great camera bag cut and sew project on Spoonflower this week! 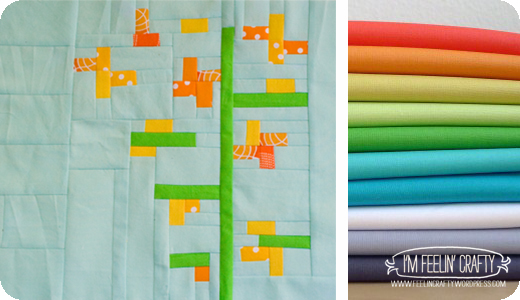 And of course, you can’t go to Spoonflower without looking around and I found a few other cut and sew projects that I love! 1. So my friend that is visiting has a 2-year-old daughter and she LOVES airplanes! 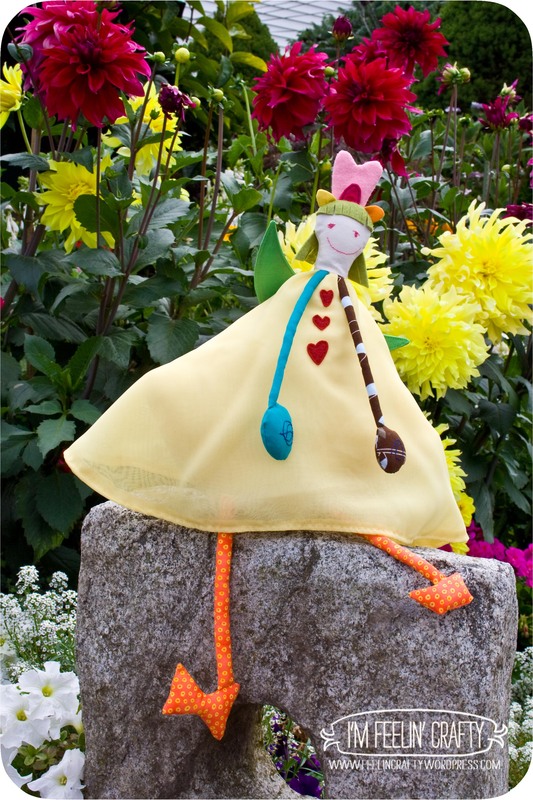 Lucky for her we live under the flight path to the airport… And she loves stuffies, so how perfect is this plane doll design by Tante_Lein? Except I would need to add a tag, because tags are so in these days, at least in the eyes of this 2-year-old! 2. 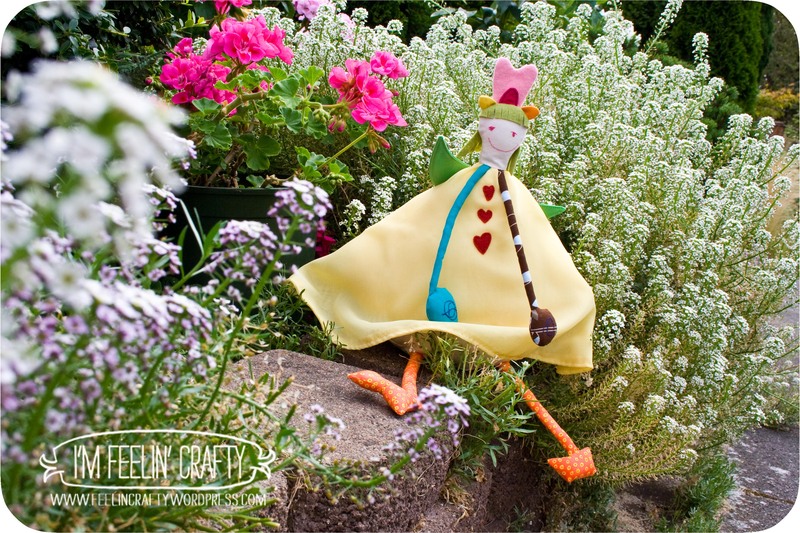 I love the skeleton doll by Happy Sew Lucky ! I think I love it most because it has the pumpkin dress!! 3. All of a sudden yesterday my son started singing this song about Yeti’s. it must have been from a show he watched, but it’s hilarious! After one day he of singing this song he decided he wanted his next birthday party to be a Yeti party! hmmmm… I bet he’d love this Yeti doll from KFay. 4. Speaking of parties, my nephew is about to have a Ninja birthday party. These little ninja guys from Engravogirl would make a great party favor! 5. And the very cool camera bag that started this whole thing…. From Happy Sew Lucky. Do you all know what Spoonflower is? It’s a company that prints your designs on fabric. So you can design something, upload and sell it. You can buy it just for you or you can put it out for everyone else to buy too. There are some FANTASTIC fabric designs on there! Has anyone uploaded any designs for sell???? 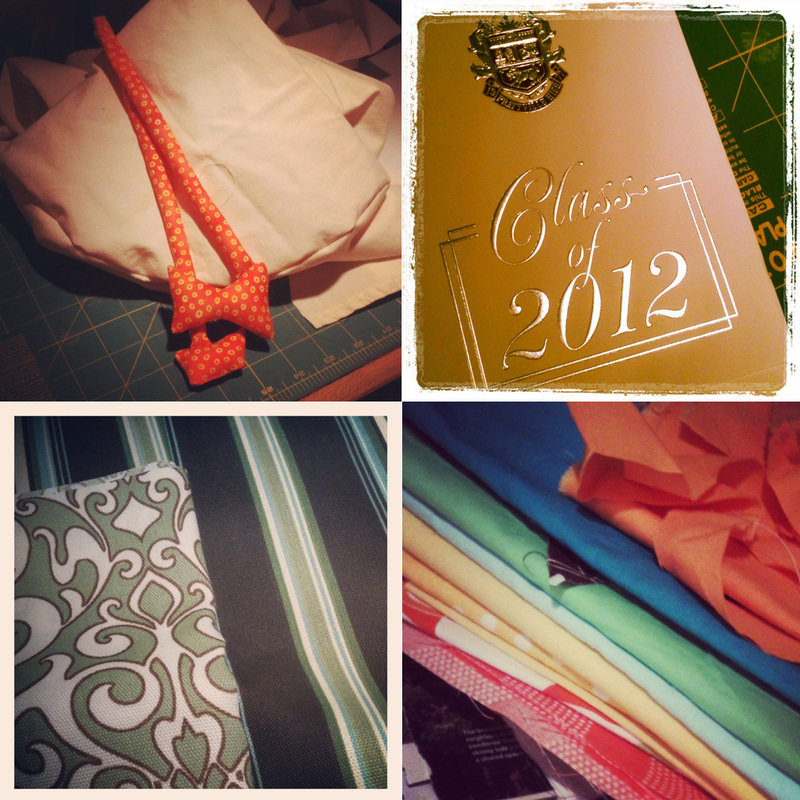 Feel free to share your favorite Spoonflower fabric or cut and sew project with us!! 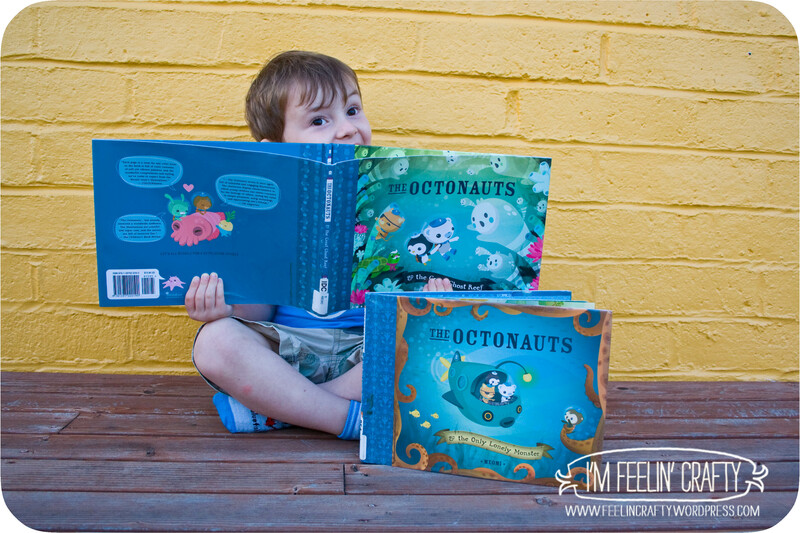 Do you know the Octonauts?? 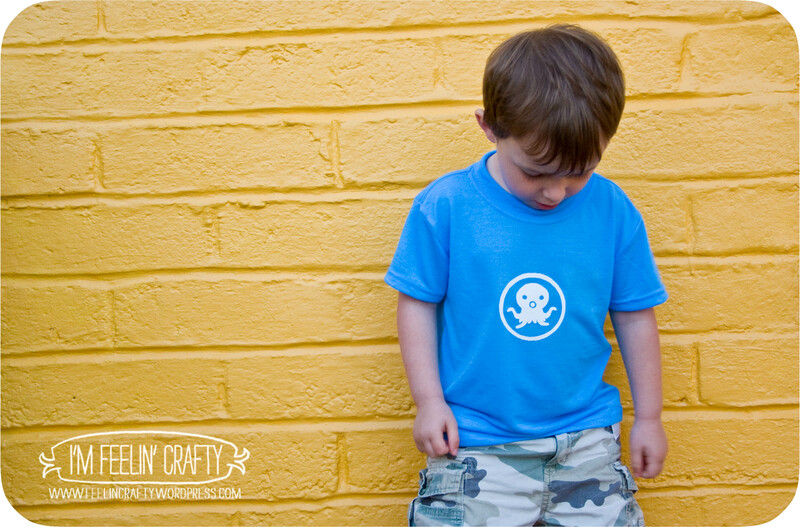 WE LOVE THE OCTONAUTS! They are really cool. The stories all about under water adventures and tech kids about under water animals. And the graphics are very cool. 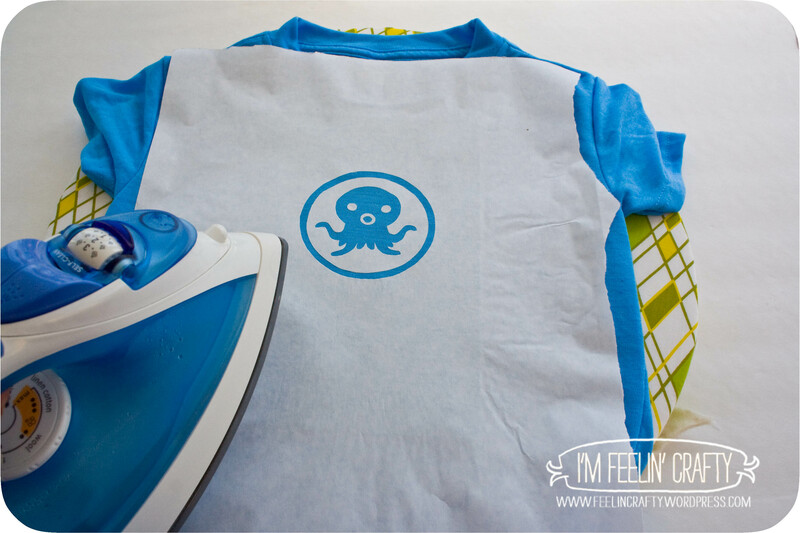 I love them, my kiddo loves them and even Dad saw them and said, ‘They’re cool!’ So the image is the Octonauts logo. An Octopus, which I also love…. 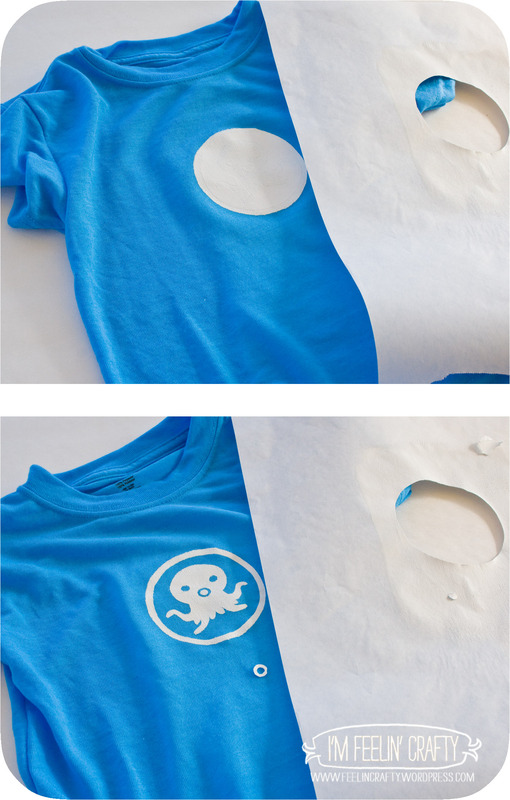 Since I love octopi and the kiddo loves Octonauts, I decided to make him one. Freezer paper (of course…), which you can purchase at most local grocery stores. T-shirt or some item of clothing. Step 2: Cut out you image. 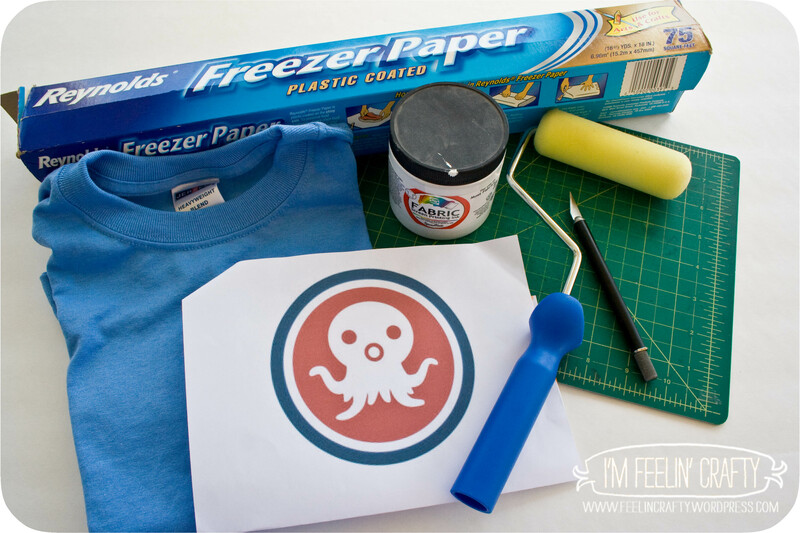 Layout your image on the freezer paper. You want to cut so that the shiny side of the paper is down. Step 3: Iron the freezer paper onto the t-shirt with the shiny side towards the fabric. 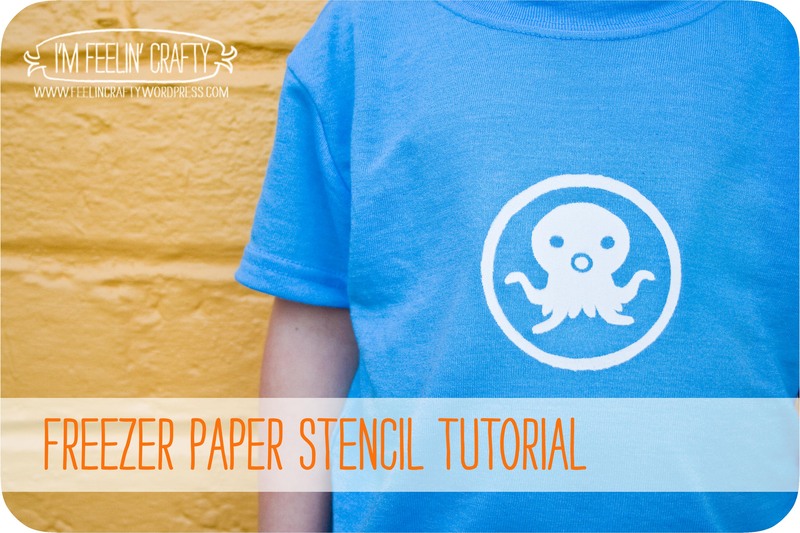 The freezer paper will stick to the shirt. 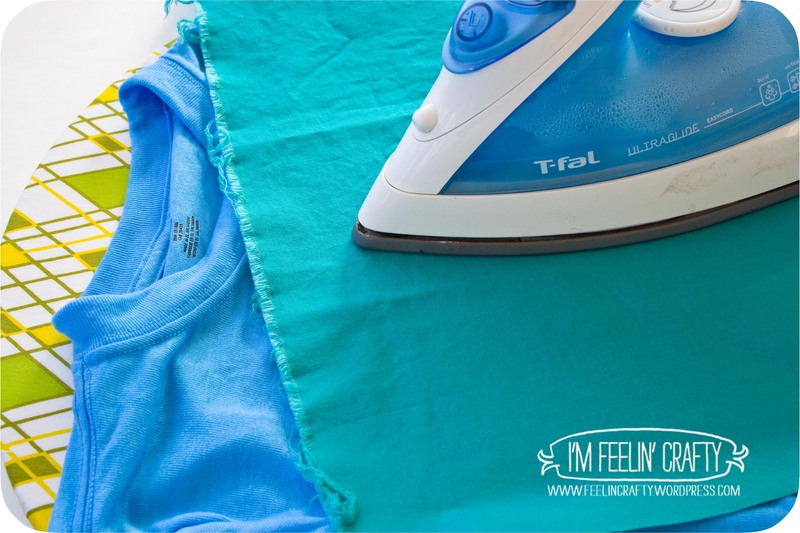 I typically have my iron on HOT, and I left it there for this project! Step 4: Paint! And let it dry. I’m a bit impatient when it comes to things like this, sooooo… I used a hair dryer to help it dry faster! Step 5: Then just peel away the freezer paper! 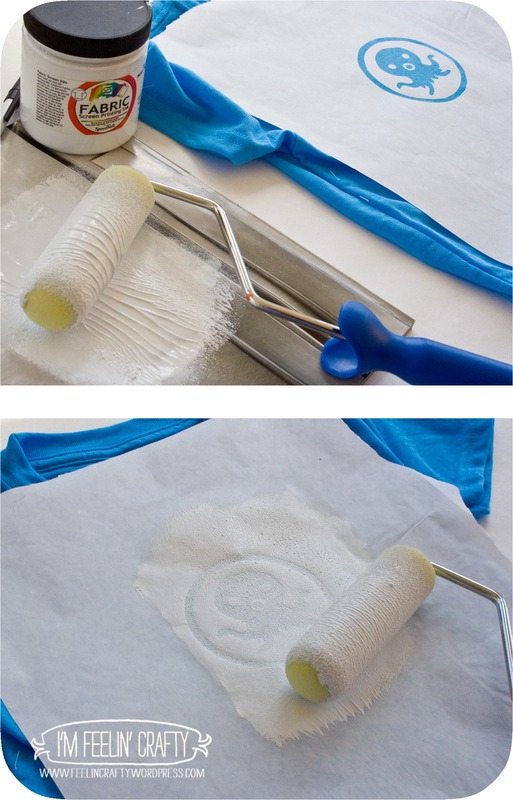 Step 6: Set the paint per the paint instructions. Has anyone else made these? What image did you use? And if you haven’t made this, what image would you use? I soooooo want to go to Quilt Con in February!! But with my job/life situation so up in the air, I just can’t plan for it right now… picture, a very sad face…. Are you going?? Do you know what it is?? It’s the inaugural conference and show by and for The Modern Quilt Guild. 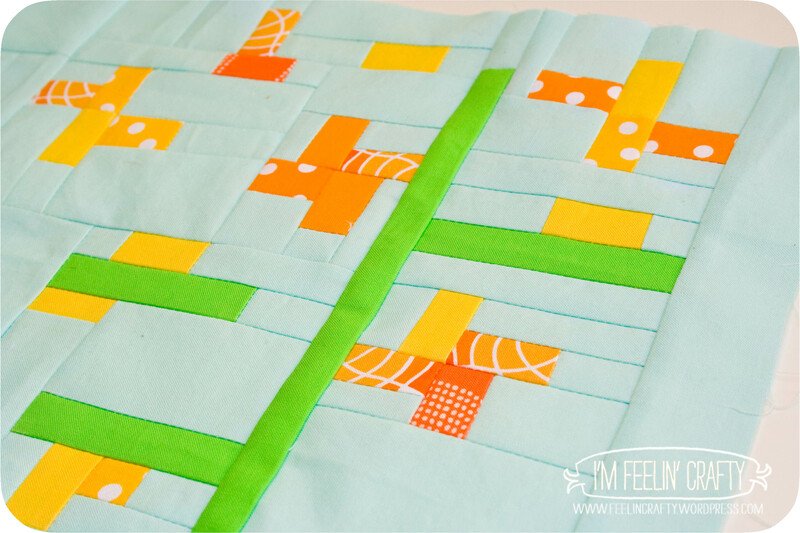 The first modern quilting event of its kind! QuiltCon will feature top modern quilting instructors. There will be workshops and lectures by Denyse Schmidt, Malka Dubrawsky, Elizabeth Hartman, Anna Maria Horner, Weeks Ringle and Bill Kerr. How cool is this??? So cool… See why I want to go??? They are also having all sorts of challenges and quilt shows that you can submit for. The one that has been going on for a while is the QuiltCon Block Challenge. The challenge was to create a block out of the colors of the Quilt Con Logo. It has to be a certain size with no applique. There were a couple more rules, but I’m not going into them all! So a while back I decided I was going to make a block. 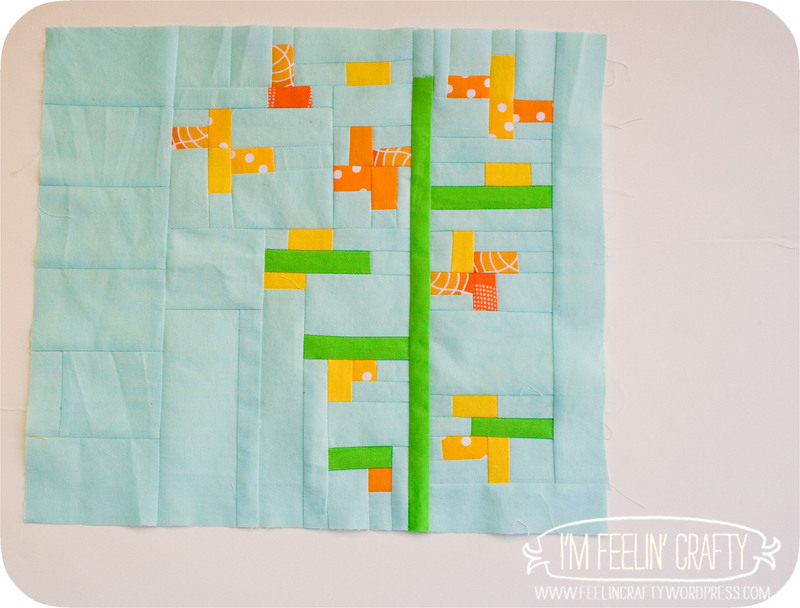 I really wanted to make another pin wheel block with no applique. But it never happened. Then I decided I didn’t have the time. Then time was running out… Blocks have to be postmarked by tomorrow. So I decided to do it! Ha! Seriously, this is so me. I had months and planned to do it months ago, then no, then yes super fast! Photo credit for the fabric picture, Quilt Con website. You could use all or just some of the colors, so I chose to use the tealish blue, orange, yellow and green. 15 to 20 of the blocks will be used in a quilt for a raffle at the conference. The majority of the other blocks will be used in quilts for charity. I hope mine makes into one of them!!!! All of a sudden, I had a job interview last week, which meant I kinda had to drop everything and get my portfolio together. Yes, I’ve been putting that off since the day I got laid off too… Then a friend asked me to do a design for a MIL garage apartment, so I’ve been coordinating a meeting on that and thinking about it. Then another friend recommended me to his firm for some upcoming positions, so I had another interview this week. And… My husband’s work needed me to come in and work for them! They didn’t have much for my husband to do, so they told him to stay home and take care of our son. Funny, huh!?! So this week, totally unexpected, with no time to mentally prepare, I’ve gone from unemployed, stay at home, crafting, blogging mom to working 40 hours a week!!! And mind you, it’s still August. Not September!! It’s been really good for me, but not what I was expecting when I was expecting it. Meanwhile, my house is a mess and projects are piling up!!! The 4 projects that have to get done ASAP are a doll, graduation gift bags that I haven’t sent yet, some curtains, and my submission to the Quilt Con Block project!!! How did I used to do all these things and work too? I can’t remember!! But I’ve got to get used to it real fast! Well, that is if either of these interviews pan out to anything… I liked both places, so I’m excited to hear back. Ok, that’s enough ranting from me for one day! 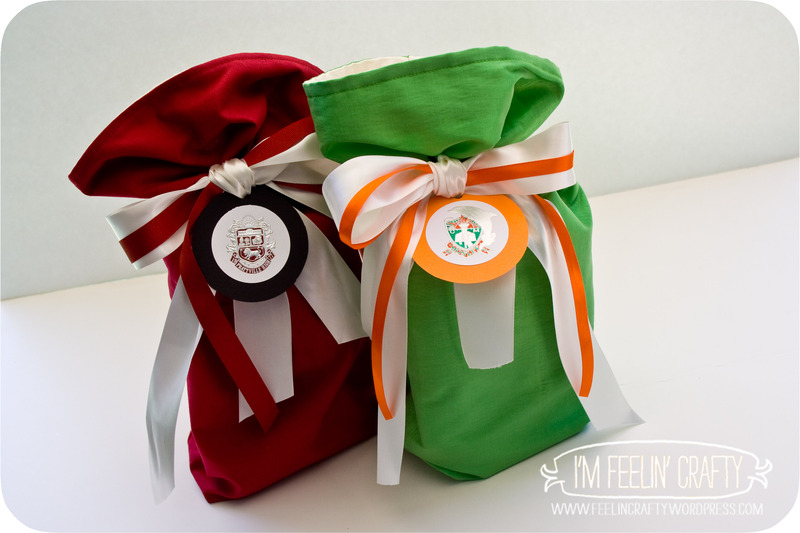 Are there other mom’s out there that work and are obsessive about their crafting? How do you get it all done??? Remind me please… Oh, and I’m trying not to stay up to 2AM every day, too! With that said, it’s 10.40PM and I’m off to sew for a few minutes! Another super simple tutorial! 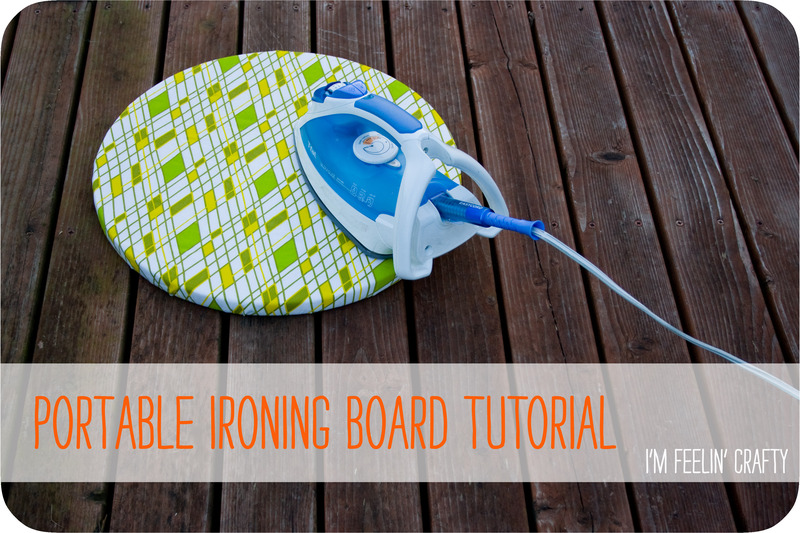 A portable ironing board! 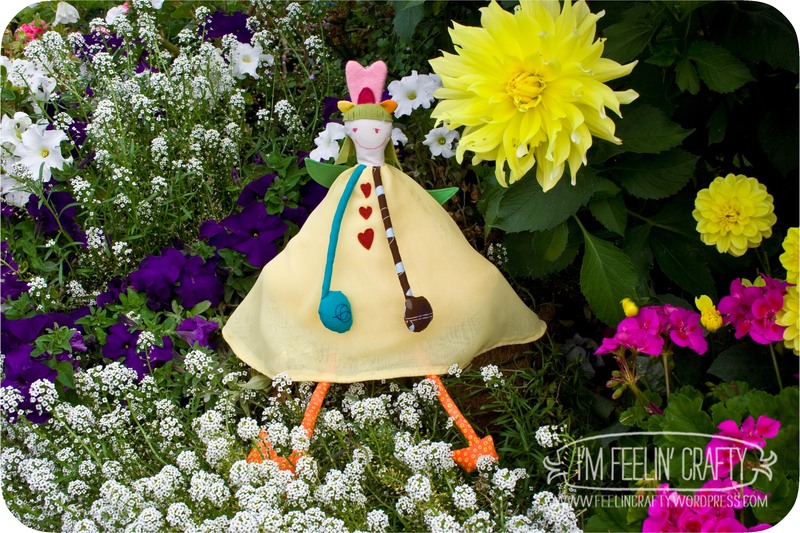 With the weather (finally) turning nice around here, I like to take my sewing machine outside and sew in the sun! The problem is, I hate carrying up the ironing board… So I thought, why don’t I make a tiny ironing board to take outside with me??? 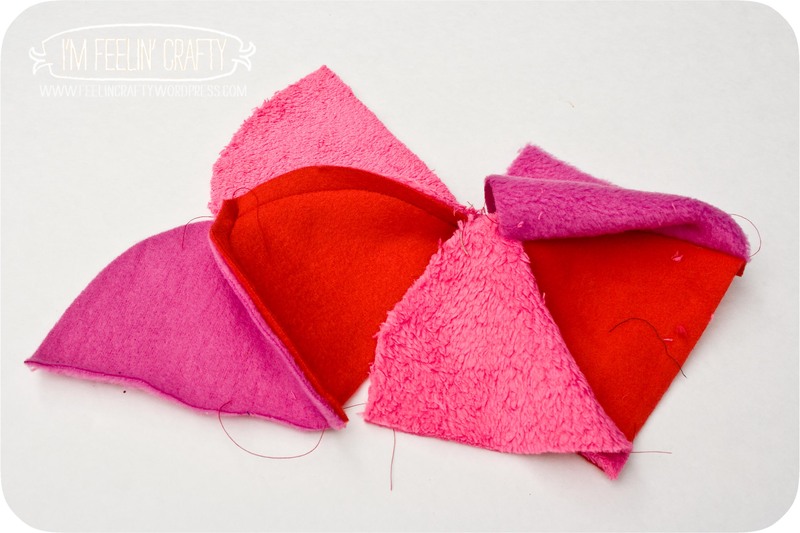 It’s so simple, it’s getting a simple tutorial to go along with the simplicity of the project! 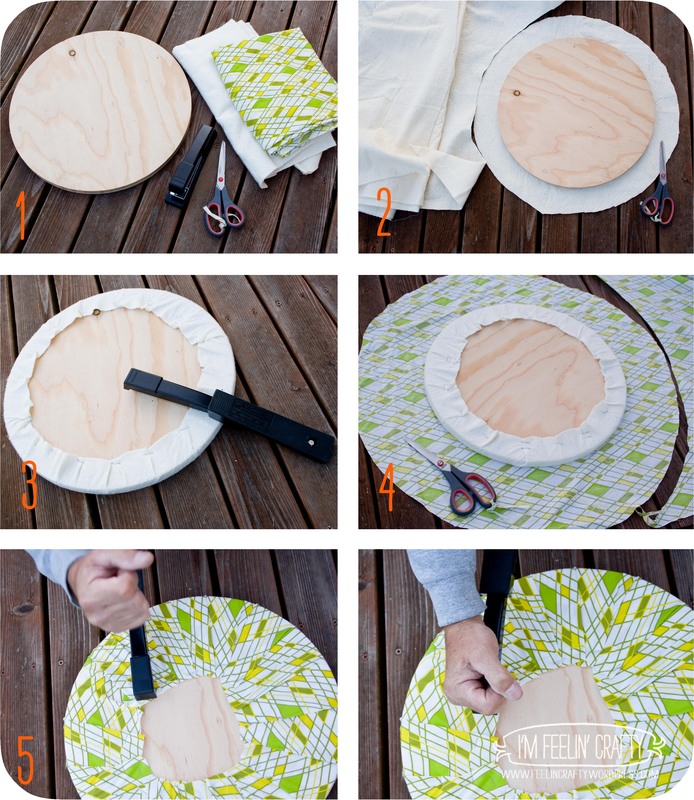 Step 1: Gather your materials, A round piece of plywood (from Lowe’s), batting, fabric, stapler or staple gun, scissors. 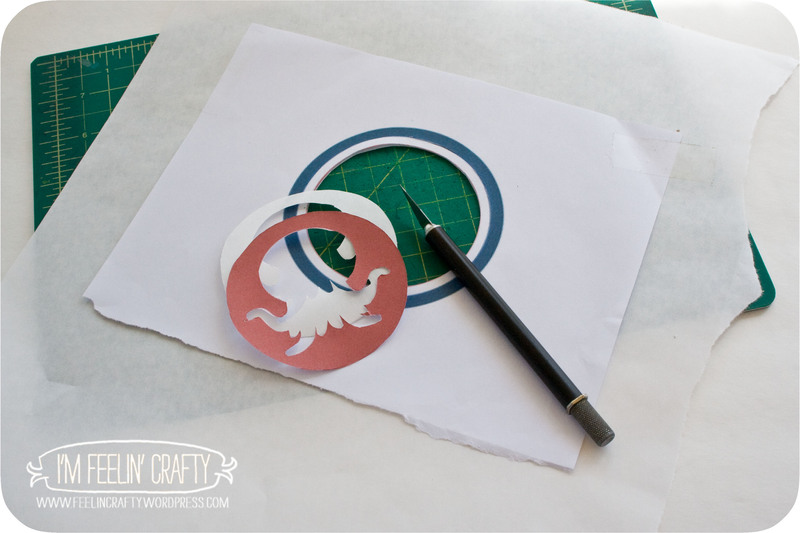 Step 2: Cut out the batting about 2 or 3 inches larger than the circle. Step 3: Pull the batting tight and staple it to the plywood as you go around the circle. Step 4: Cut the fabric about 4 to 6 inches larger than the circle. Step 5: Pull the fabric tight around the circle and staple as you go. I totally recommend a staple gun if you want to do this by yourself! Or if you’re super strong and don’t need someone stronger than yourself, you might not need a staple gun. My sweet husband had to help me with the staple part. Since we were out-of-town we didn’t have our staple gun, so I had to enlist the help of my husband to do the stapling with the plain ‘ole stapler. And WAH-LA!! 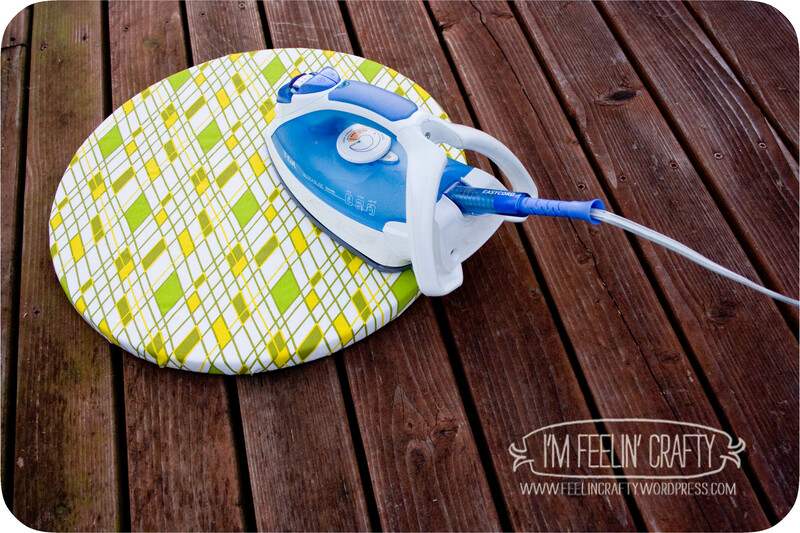 You now have you’re very own portable ironing board! 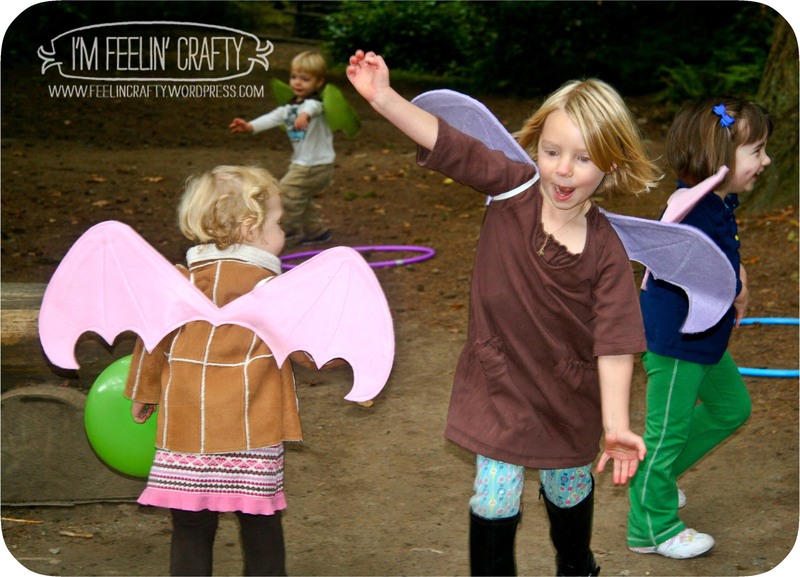 What are you going to take outside to sew and iron?? So here are some of my favorites! Take a look, print and fold! 1. I love this forest scene with a tree, squirrel, bunnies, wolf, owl and monkey from KIRIN via My Owl Barn. I love that the monkey is in with the rest of the typical forest animals! 2. 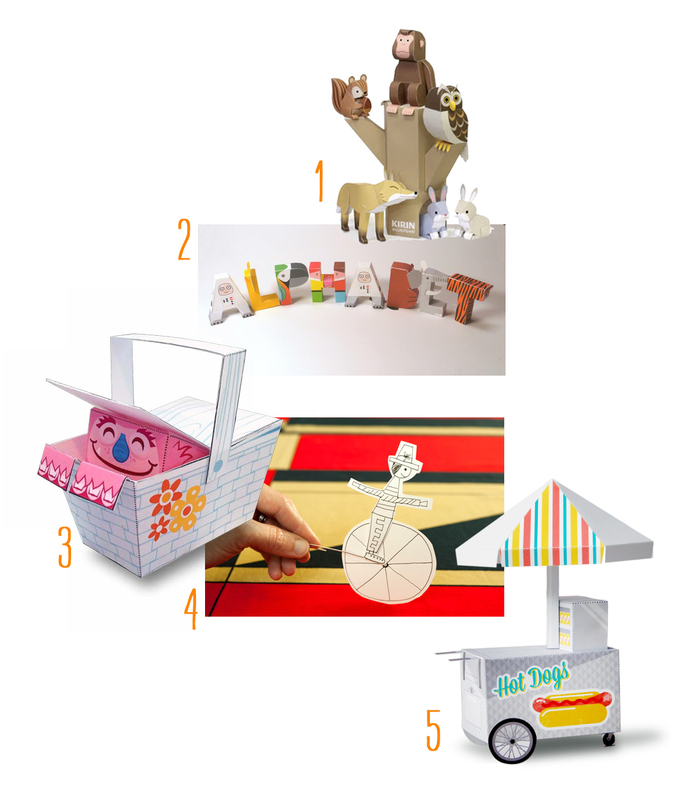 This alphabet is what reminded me this week of all these papercraft ‘toys.’ This alphabet by Digitprop could be great for SOOO many things!! Fun for a nursery, a great way to start learning the letters, or as they say leaving a note for someone! I love it! 3. How cute if this Basket Monster monitor monster by Scout Creative for HP and Best Buy??? 4. Do you know Made by Joel?? He’s awesome! He’s kinda famous for his paper city printables that are also awesome. But I LOVE this little circus guy. 5. And another one by Scout Creative. This month’s calendar is a really cool Hot Dog Stand. I should have printed this to go along with my Hot Dog Bun vest… But I guess National Hot Dog Day was in July and this is August. OK, I don’t feel so bad! hehehe….